No time to workout? Got 10 minutes? Good, you only need around 7 minutes to complete this workout. Need a good workout? You need this: The Scientific 7-Minute Workout – NYTimes.com. 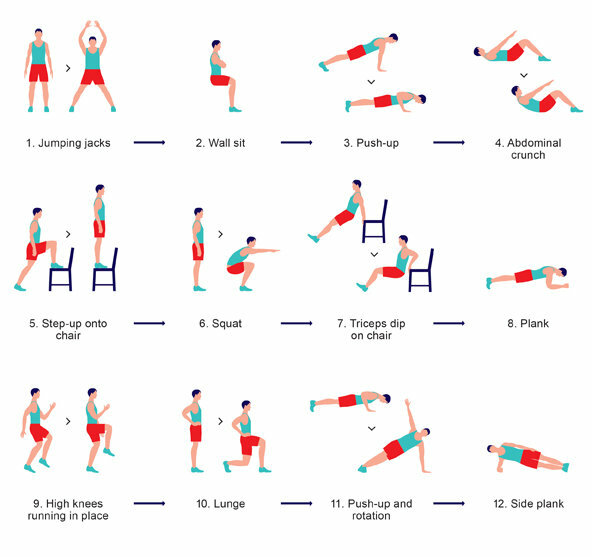 Do these 12 exercise, 30 seconds per exercise with 10 seconds in between, and in 7 minutes you have worked out all your major muscle groups. If you take 10 seconds between each exercise, it adds up to 8 minutes. If you take no time between exercises, it 6 minutes. Either way, in less than 10 minutes and you are done. If you want the details on how effective this is, the paper on it is here: HIGH-INTENSITY CIRCUIT TRAINING USING BODY WEIGHT: Maximum R… : ACSM’s Health & Fitness Journal.